Since the value of m_nOrigOutputs is outside the scope of the array request space, an out-of-bounds write will occur at line #55 of Figure 2. With the help of the ASAN crash dump, we can locate the following source code: The size of the array is determined by the return value of the following function. 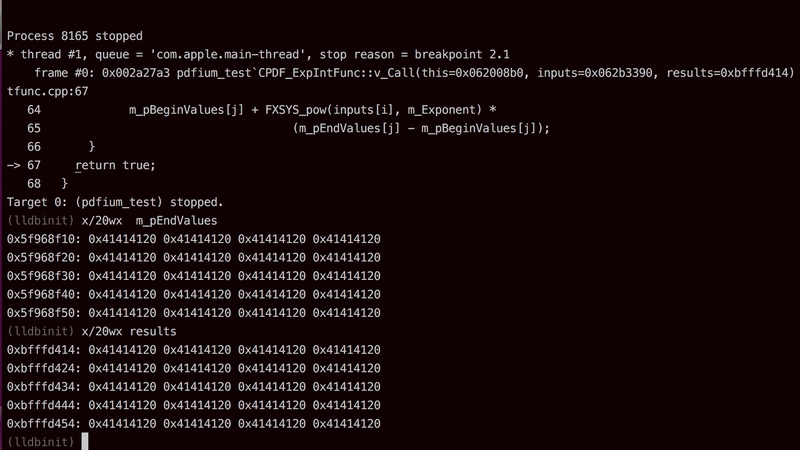 In Figure 4, set breakpoint at code line #100, after running multiple times, we can see that the value of total overflows when parsing the poc file. Since the variables (m_nOrigOutputs, m_Exponent) can be precisely controlled in the pdf file by controlling the corresponding fields, we can simplify the assignment action . Control m_Exponent = 0, then FXSYS_pow(input [i],m_Exponent) will always be 1. The contents of m_pEndValues array come from the pdf file and are fully controllable, so it’s very simple to exploit this vulnerability. 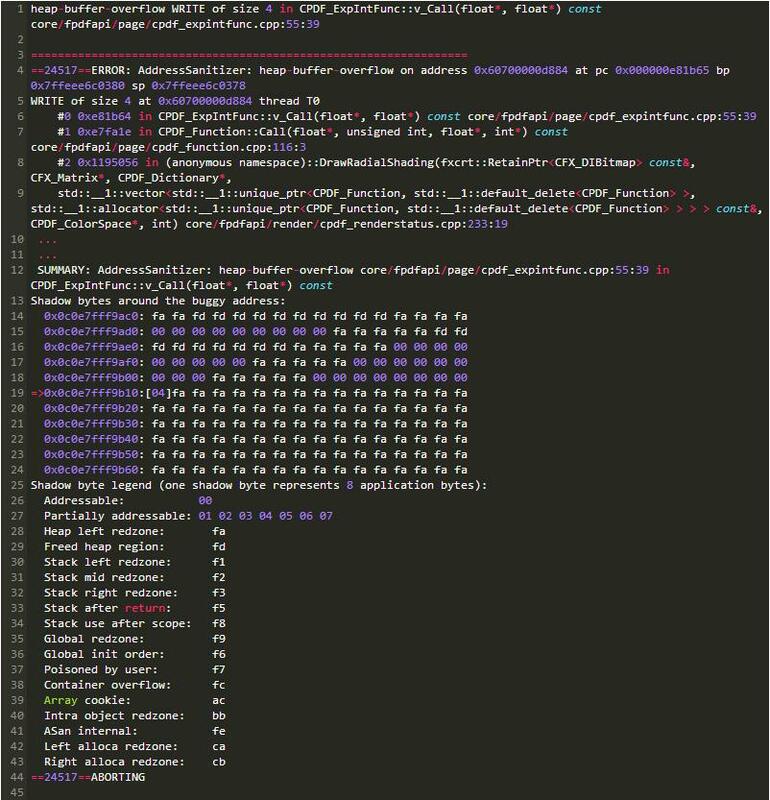 Using FX_SAFE_UINT32 replace previous uint32_t, the representation in memory : the upper four bytes are the value of unsigned int, and the lower four bytes hold the data overflow identifier. (2) Otherwise use the parameter (total_results) to request a piece of memory on the heap. The problem is that the argument passed in here is unsigned int, while the formal parameter is int. For the latest stable version, the new vulnerability described in this section is no longer exploitable, so we decided to disclose the details here. More than three years of functional discussion once again accidentally killed the bug. 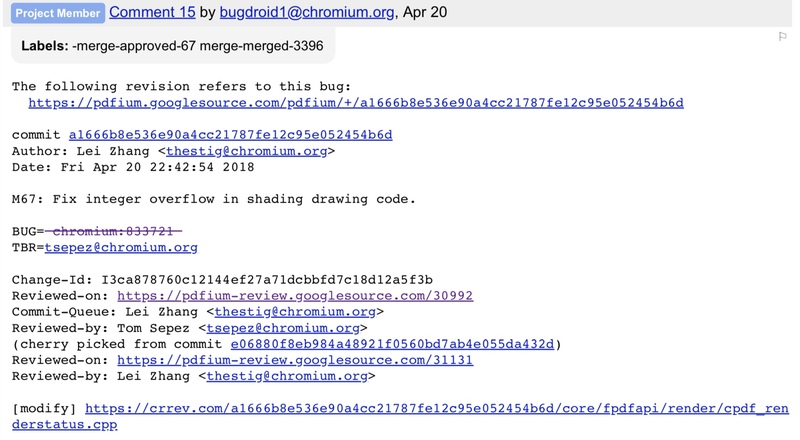 after a series of performance tests passed, Chrome removed the CFX_FixedBufGrow type and replaced it with std::vector. For more information, please refer to link .